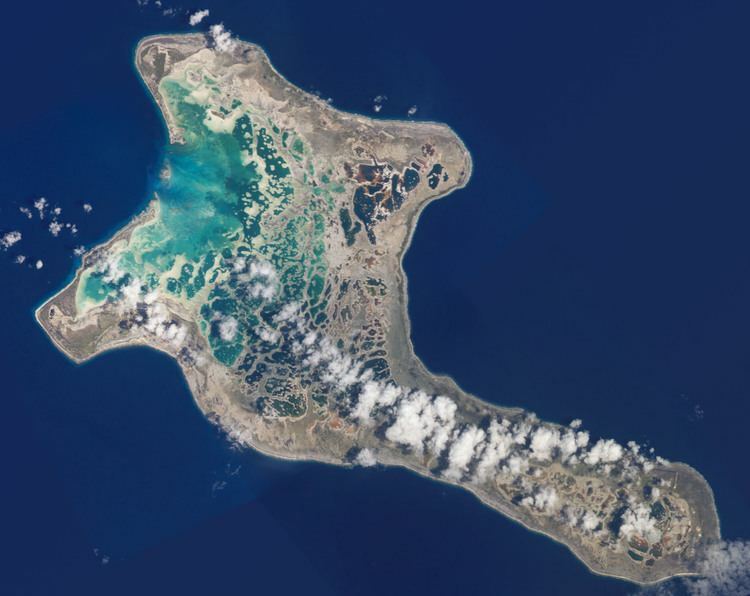 The name "Kiritimati" is a respelling of the English word "Christmas" in the Kiribati language, in which the combination ti is pronounced s, and the name is thus pronounced . Kiritimati was discovered to Europeans by the Spanish expedition of Hernando de Grijalva in 1537, that charted it as Acea. This discovery was referred by a contemporary, the Portuguese António Galvão, governor of Ternate, in his book Tratado dos Descubrimientos of 1563. Captain James Cook visited it on Christmas Eve (24 December) 1777. It was claimed by the United States under the Guano Islands Act of 1856, though little actual mining of guano took place. Kiritimati was occupied by the Allies in World War II; the Americans took over the island garrison, allowing Australian troops to use it for mainland defense. The first contingent of Americans was a company from the 102nd Infantry Regiment, a National Guard unit from New Haven, Connecticut. The Island was important to hold because if the Japanese had captured it, an airbase could have been constructed that would have allowed interdiction of the main Hawaii-to-Australia supply route. For the first few months there were next to no recreational facilities on the island, and the men amused themselves by shooting at sharks that swam into the lagoon. During the dispute over the Carolines between Germany and Spain in 1885, arbitrated by Pope Leo XIII, the sovereignty of Spain over the Caroline and Palau islands as part of the Spanish East Indies was analyzed by a commission of cardinals and confirmed by an agreement signed on 17 December. Its Article 2 specifies the limits of Spanish sovereignty in South Micronesia, being formed by the Equator and 11°N Latitude and by 133° and by 164° Longitude. In 1899, Spain sold the Marianas, Carolinas and Palaus to Germany after its defeat in 1898 in the Spanish–American War. However Emilio Pastor Santos, a researcher of the Spanish National Research Council, claimed in 1948 that there was historical basis, supported by the charts and maps of the time, to argue that Kiritimati (or Acea as in the Spanish maps) and some other islands had never been considered part of the Carolines. Thus Kiritimati was not included in the description of the territory transferred to Germany, and therefore was not affected on the part of Spain to any cessation of transfer and theoretically Spain should have the only jurisdiction and right to this island. During the Cold War there was some nuclear weapons testing in the Kiritimati area. The United Kingdom conducted its first successful hydrogen bomb test at Malden Island on 15 May 1957; Kiritimati was the operation's main base. In fact, this test did not work as planned, and the first British H-bomb was successfully detonated over the southeastern tip of Kiritimati on 8 November 1957. Subsequent test series in 1958 (Grapple Y and Z) took place above or near Kiritimati itself. The United States conducted 22 successful nuclear detonations as part of Operation Dominic here in 1962. Some toponyms (like Banana and Main Camp) come from the nuclear testing period, during which at times over 4,000 servicemen were present. By 1969, military interest in Kiritimati had ceased and the facilities were abandoned and for the most part dismantled. Some communications, transport and logistics facilities, however, were converted for civilian use and it is due to these installations that Kiritimati came to serve as the administrative center for the Line Islands. The United Kingdom detonated some 5 megatonnes of TNT (21 PJ) of nuclear payload near and 1.8 megatonnes of TNT (7.5 PJ) directly above Kiritimati in 1957/58, while the total yield of weapons tested by the United States in the vicinity of the island between 25 April and 11 July 1962 was 24-megatonne-of-TNT (100 PJ). 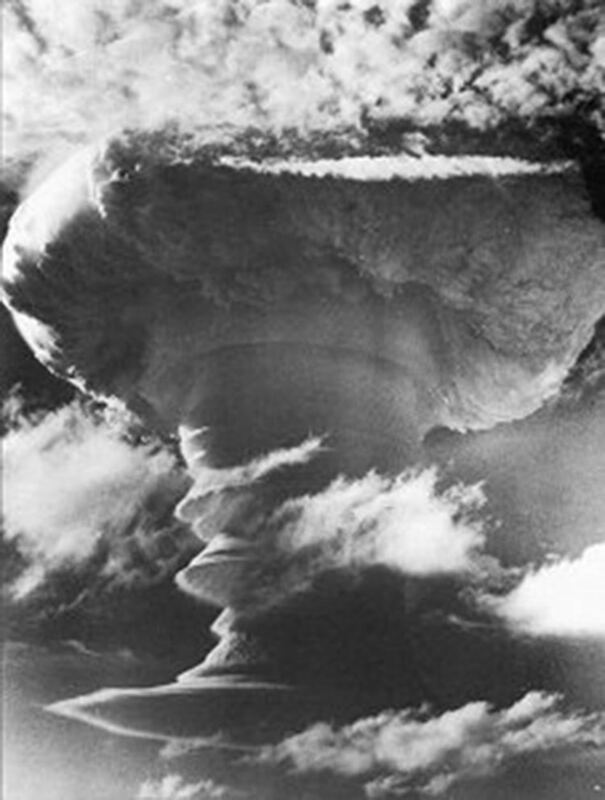 During the British Grapple X test of 8 November 1957 which took place directly above the southeastern tip of Kiritimati, yield was stronger than expected and there was some blast damage in the settlements. Islanders were usually not evacuated during the nuclear weapons testing, and data on the environmental and public health impact of these tests remains contested. Although Air Pacific hoped to commence on 25 May 2010 flying on a weekly schedule to Kiritimati Island from both Honolulu and Fiji, they canceled reservations for those flights explaining that the runway is not suitable. Rebranded Fiji Airways has resumed services from Nadi and Honolulu to Kiritimati with one Boeing 737 service per week. A monthly air freight service is flown using a chartered Boeing 727 from Honolulu operated by Asia Pacific Airlines. The abandoned Aeon Field, constructed before the British nuclear tests, is located on the southeastern peninsula, NW of South East Point. Most of the atoll's food supplies have to be imported. Potable water can be in short supply, especially around November in La Niña years. A large and modern jetty, handling some cargo, was built by the Japanese at London. Marine fish provide a healthy portion of the island's nutrition, although overfishing has caused a drastic decrease in the populations of large, predatory fish over the last several years. Exports of the atoll are mainly copra (dried coconut pulp); the state-owned coconut plantation covers about 51 square kilometres (20 sq mi). In addition, goods like aquarium fish and seaweed are exported. A 1970s project to commercially breed Artemia salina brine shrimp in the salt ponds was abandoned in 1978. In recent years there have been attempts to explore the viability of live crayfish and chilled fish exports and salt production. Furthermore, there is a small amount of tourism, mainly associated with anglers interested in lagoon fishing (for bonefish in particular) or offshore fishing. Week-long ecotourism packages during which some of the normally closed areas can be visited are also available. In recent years, surfers have discovered that there are good waves during the Northern Hemisphere's winter season and there are interests developing to service these recreational tourists. There is some tourism-related infrastructure, such as a small hotel, rental facilities, and takeaways. Joe's Hill (originally La colline de Joe) near Artemia Corners on the southeastern peninsula is the highest point on the atoll, at about 13 m (43 ft) ASL. On the northwestern peninsula for example, the land raises only to some 7 m (20 ft), which is still considerable for an atoll. Despite its proximity to the ITCZ, Kiritimati is located in an equatorial dry zone and rainfall is rather low except during El Niño years; 873 mm (34.4 in) on average per year, in some years it can be as little as 177 mm (7.0 in) and much of the flats and ponds can dry up such as in late 1978. On the other hand, in some exceptionally wet years abundant downpours in March–April may result in a total annual precipitation of over 2,500 mm (98 in). Kiritimati is thus affected by regular, severe droughts. They are exacerbated by its geological structure; climatically "dry" Pacific islands are more typically located in the "desert belt" at about 30°N or S latitude. Kiritimati is a raised atoll, and although it does occasionally receive plenty of precipitation, little is retained given the porous carbonatic rock, the thin soil, and the absence of dense vegetation cover on much of the island, while evaporation is constantly high. 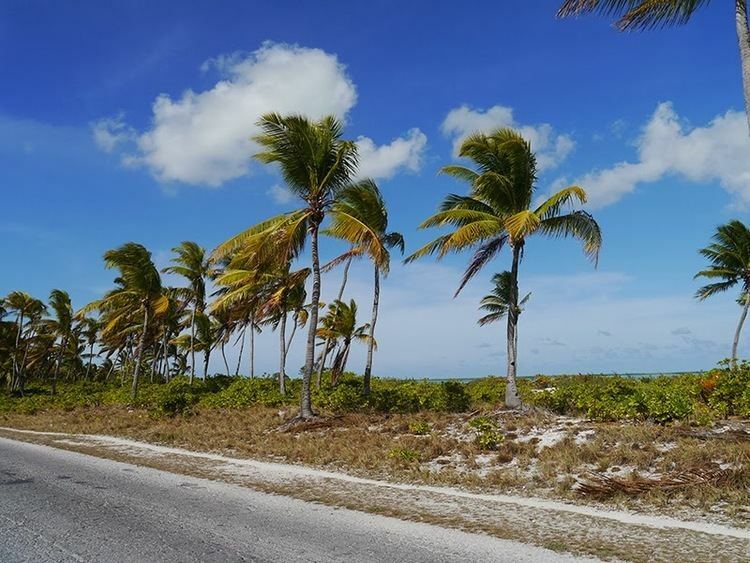 Consequently, Kiritimati is one of the rather few places close to the Equator which have an effectively arid climate. The only mammals native to the region are the common Polynesian rat (Rattus exulans), and the goat, but even these are tricky. Indeed, the rat would seem to have been introduced by native seafarers numerous centuries before Cook found Kiritimati in 1777, and the goat is extinct since 14 January 2004. Black rats (Rattus rattus) were present at some time, perhaps introduced by 19th century sailors or during the nuclear tests. They have not been able to gain a foothold between predation by cats and competitive exclusion by Polynesian rats, and no black rat population is found on Kiritimati today.